John Marciano is professor emeritus of education at the State University of New York, Cortland, and a longtime activist, teacher, and trade unionist. This article is adapted from The American War in Vietnam: Crime or Commemoration? (Monthly Review Press, 2016). The war was waged “against the entire Vietnamese population,” designed to terrorize them into submission. The United States “made South Vietnam a sea of fire as a matter of policy, turning an entire nation into a target. This is not accidental but intentional and intrinsic to the U.S.’s strategic and political premises.” In such an attack “against an entire people…barbarism can be the only consequence of [U.S.] tactics,” conceived and organized by “the true architects of terror,” the “respected men of manners and conventional views who calculate and act behind desks and computers rather than in villages in the field.”3 The U.S. abuse of Vietnamese civilians and prisoners of war was strictly prohibited by the Geneva Convention, which the United States signed. U.S. officials and media pundits continue to assert that torture is a violation of “our values.” This is not true. Torture is as American as apple pie, widely practiced in wars and prisons. The assertion that the mainstream media opposed and undermined the war effort is one of the great myths of the Vietnam conflict. They endorsed U.S. support of French colonialism and only emerged as tactical critics of the war after the Tet Offensive in early 1968. The corporate media never challenged the fundamental premises of this imperial war. Though miniscule when compared to the astronomical level of violence in Vietnam, antiwar violence by college youth received more attention from the media and the public. In fact, however, it was an extremely small part of an activist antiwar movement that “numbered more than 9,400 protest incidents recorded during the Vietnam era, as well as thousands of demonstrations, vigils, letter writing [campaigns], teach-ins, mass media presentations, articles and books [and petitioning] congressional representatives.”15 Added to these activities was an explosion of antiwar news sources across the country, beyond college campuses. There were countless antiwar papers published by active-duty soldiers and veterans who opposed the war, such as Vietnam GI, the VVAW paper. President Obama and the 2015 official commemoration have urged citizens to support and honor those who served in Vietnam—an appeal that certainly does not extend to the antiwar activists of the VVAW. This charge to support the military in Vietnam—and all wars since—implicitly asks citizens to support uncritically any U.S. conflict. As the war continued, the VVAW rejected such a view, in the face of condemnation from prominent public officials, the American Legion, and Veterans of Foreign Wars. Real support for the troops should not consist of cheap flyovers at sporting events; corporate campaigns to raise funds for veterans that are pennies on the dollar alongside vast profits from military contracts; performing empty flag-waving gestures while supporting political efforts in Washington to cut funds for wounded and disabled veterans and other needed programs; or assuring veterans that the war was a noble cause when it was not. President Obama’s claim in his Vietnam commemoration speech—that Americans “hate war” and “only fight to protect ourselves because it’s necessary”—is the latest in a long line of fantastical pronouncements by U.S. officials. Even an elementary knowledge of U.S. wars since the founding of the nation would dispel this delusion. These include the genocidal Indian Wars that lasted more than a century until 1890; wars of aggression against Cuban, Philippine, and Puerto Rican independence struggles in the late nineteenth and early twentieth centuries; and the overthrow of forty-one governments in Latin America between 1898 and 1994.24 There is also Korea, Vietnam, Panama, Iraq (twice, in 1991 and 2003, in addition to genocidal economic sanctions in between), and Afghanistan, with the latter two both still underway, and many more documented in the Congressional Research Service’s important study, released in September 2014, that tallied hundreds of U.S. military interventions. As Veterans for Peace note on their website: “America has been at war 222 out of 239 years since 1776. Let that sink in for a moment.” Since the end of the shooting war in Vietnam in April 1975, virtually every calendar year has seen the presence of U.S. military forces abroad, in Southeast Asia, the Middle East, Africa, Central Asia, and Eastern Europe. A number of these nations have seen multiple U.S. military interventions under various presidents over the past forty years since the end of the Vietnam War.25 The historical record, therefore, reveals a nation that is wedded to war. After every war that the United States has fought, a new chapter is added to history textbooks, one that interprets the conflict for succeeding generations. The new narratives stress the necessity of its involvement and America’s role and conduct during the war. Some describe the excesses and even the criminal behavior of the U.S. military, but never define these as such or acknowledge their central place in the conduct of the war. 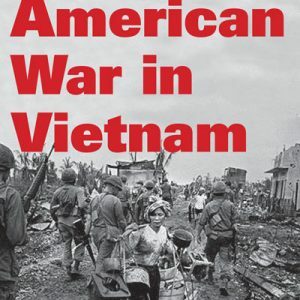 U.S. history textbooks essentially portray U.S. aggression against Vietnam as a failed defense of democracy and freedom; it was a “mistake” and a “tragedy,” with noble goals. The thesis that the conflict was an illegal act of state aggression is considered unworthy of critical examination. The parameters established by these texts do not allow students to consider the possibility that the Vietnamese resistance was a justifiable liberation struggle against foreign aggression and a brutally authoritarian regime. Forty years after the American war in Vietnam ended in 1975, the central and most critical issue is the “struggle for memory,” an ideological war over the most accurate and truthful story of the conflict. Whose ideas about the war will prevail? This struggle will help determine how we, the people, will respond to present and future U.S. international conflicts. 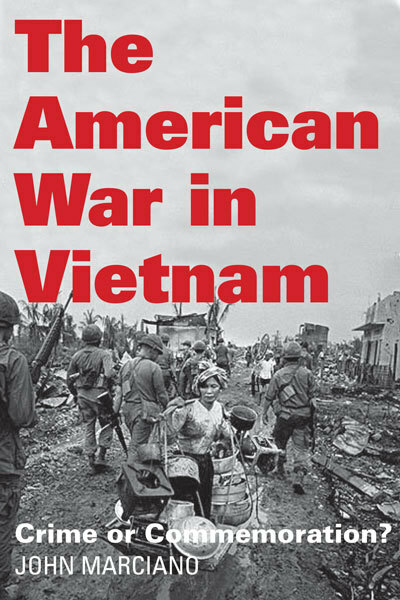 If citizens are to understand the role of U.S. governmental and corporate elites in initiating the current endless wars, they must develop an accurate and comprehensive understanding of the history of the war in Vietnam. Such an analysis will provide the critical tools with which to counter the hyper-patriotism of the official Vietnam commemoration, whose lessons are based on the dominant and false story of U.S. beneficence: a nation forever faithful in its quest for justice that always follows a righteous path in its wartime conduct. Another story must be told: that of a decades-long reign of terror against the people of Vietnam, a shameful war that no government-sanctioned lesson or eloquent rhetoric can hide. ↩Noam Chomsky, Towards a New Cold War (New York: New Press, 2003), 6, 93, 98. It is a testament to the strength of the dominant view of American foreign policy that Chomsky, an internationally renowned scholar and intellectual, was virtually unknown to nearly all of the more than six thousand students I taught over the course of thirty-one years at the State University of New York, Cortland. Some had heard of him, but it was rare to find a student who had read any of his writings. In addition to Chomsky’s many books, readers should examine William Blum, Rogue State (Monroe, ME: Common Courage, 2000) and G. William Domhoff, Who Rules America? (New York: McGraw-Hill, 2013). ↩Gabriel Kolko, “War Crimes and The Nature of the Vietnam War,” in Richard Falk, Gabriel Kolko, and Robert Jay Lifton, eds., Crimes of War (New York: Vintage, 1971), 412–13; Kolko, “On the Avoidance of Reality,” Crimes of War , 15. ↩Daniel Ellsberg, Secrets (New York: Penguin, 2002), 12. ↩Christian Appy, Working Class War (Chapel Hill, NC: University of North Carolina Press, 1993), 253. ↩Dr. Martin Luther King Jr., “Beyond Vietnam: A Time to Break Silence,” April 4, 1967, Riverside Church, New York City, available at http://commondreams.org. ↩Edward Morgan, What Really Happened to the 1960s (Lawrence, KS: University of Kansas Press, 2010), 76; Daniel S. Lucks, Selma to Saigon (Lexington, KY: University Press of Kentucky Press, 2014), 203. ↩ New York Times , April 7, 1967; Washington Post , April 6, 1967. ↩Michael Gillen, “Roots of Opposition: The Critical Response to U.S. Indochina Policy, 1945–1954,” Ph.D. dissertation, New York University, 1991, 122. ↩Robert Buzzanco, “The American Military’s Rationale against the Vietnam War,” Political Science Quarterly 101, no. 4 (1986): 571. ↩W. D. Ehrhart, Passing Time (Jefferson, NC: McFarland, 1989), 161–62. ↩Penny Lewis, Hardhats, Hippies, and Hawks (Ithaca, NY: ILR, 2013), 4, 7. ↩Lewis, Hardhats, Hippies, and Hawks , 45. ↩Lewis, Hardhats, Hippies, and Hawks , 92; Lucks, Selma to Saigon , 3. ↩Kirkpatrick Sale, SDS (New York: Random House, 1973), 514, 48. ↩D. Michael Shafer, “The Vietnam Combat Experience: The Human Legacy,” in The Legacy: The Vietnam War in the American Imagination (Boston: Beacon, 1992), 97. ↩Quoted in Michael Bolton and Kevin Sim, Four Hours in My Lai (New York: Viking, 1992), 371. ↩Jonathan Schell, “Comment,” New Yorker , December 20, 1969, 27. ↩Nick Turse, “Misremembering America’s Wars, 2003–2054,” TomDispatch, February 18, 2014, http://tomdispatch.com. ↩Kolko, “War Crimes,” 414; “Avoidance,” 12. ↩Kendrick Oliver, The My Lai Massacre in American History and Memory (Manchester, UK: Manchester University Press, 2006), 8–9. ↩Quoted in Erwin Knoll and Judith Nies McFadden, War Crimes and the American Conscience (New York: Holt, Rinehart and Winston, 1970), 71. ↩Arthur Westing, “Return to Vietnam: The Legacy of Agent Orange,” lecture at Yale University, April 26, 2002; Westing, Ecological Consequences of the Second Indochina War (Stockholm: Stockholm International Peace Research Institute, 1974), 22. ↩Greg Grandin, “The War to Start All Wars: The 25th Anniversary of the Forgotten Invasion of Panama,” TomDispatch, December 23, 2014. See also Grandin’s excellent Empire’s Workshop (New York: Metropolitan), 2006. ↩Barbara Salazar Torreon, Instances of Use of United States Armed Forces Abroad, 1798–2014 (Washington, D.C.: Congressional Research Office, 2014). ↩Nguyen Thi Binh, “The Vietnam War and Its Lessons,” in Christopher Goscha and Maurice Vaisse, eds., The Vietnam War and Europe 1963–1973 (Brussels: Bruylant, 2003), 455–56. ↩Jerry Lembcke, “Why Students Should Stop Interviewing Vietnam Veterans,” History News Network, May 27, 2013, http://historynewsnetwork.org. ↩Noam Chomsky, “Thoughts on Intellectuals and the Schools,” Harvard Educational Review 36, no. 4 (1966): 485.